For the third year running, entries were invited for short features which demonstrate entrants production skills and was open to anyone who was either on a recognised training course or who had recently completed such a course. This years prize included a portable mini disc recorder, a place at the 1999 Radio Festival and a year's subscription to The RADIO Magazine. The award was presented at the Radio Festival in Cardiff in July. Action for Airtime Ltd, The RADIO Magazine, IRN and The Radio Partnership. The winning entry was submitted by Stuart Silver, a radio student from the Cultural Partnership training organisation in East London. The award, now in its third year, attracted a record number of entries from radio students from all parts of the United Kingdom. The judges commented that they, hope and expect that students will be bold and choose unusual topics and treat subjects freshly. Humour helps too but that was absent, apart from the well-constructed witty item on Mornington Crescent. On the whole, the subject matter of the entries was quite conventional and traditional. There are exceptions - the item on female masturbation. This was a brave piece and attempted to break barriers. In making the award to Stuart Silver, the judges commented that they were impressed by, his liveliness, enthusiasm, humour and his ability to make the listener see what he could see. He can handle live situations or make an item sound as live - a quality that all editors are looking for. Stuarts entry was a short feature about cruises aboard the London Showboat on the River Thames. (Click here for the judges comments in full). 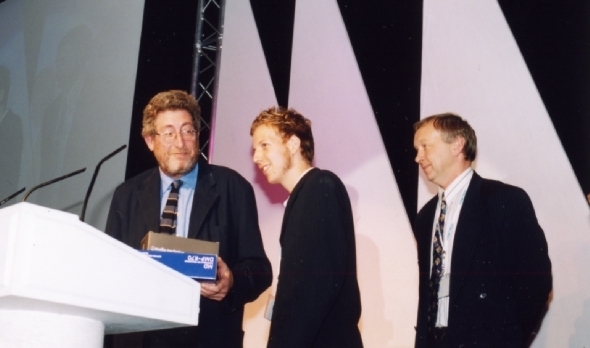 The prize was presented to Stuart on Friday 16 July 1999 at the Radio Festival in Cardiff.